Another solo show is on the horizon, featuring work by Al Honig. He is a master of recycled assemblage, and has been working in this current vein for 35 years! In his experience, he has been a photographer, a sculptor of bronze, stone and wood, and a painter as well. He worked many years repairing printing presses and other machinery, refining the skill set required to make his pieces. He draws inspiration from metal sculptor David Smith, whose book also helped Al through a creative block. Al has influenced and worked with many local artists, including Dana Albany, Pepe Ozan, and Brian Goggin. The majority of the pieces are from his series of Allegories, sculptures based on his observations and suppositions of human behavior and events. One of his favorite pieces, “Look Outs” is from that series, and will be part of what will be displayed for our show. All of his finished work is available to view online, at alhonig.com. Be sure to check out his videos while looking on his site. 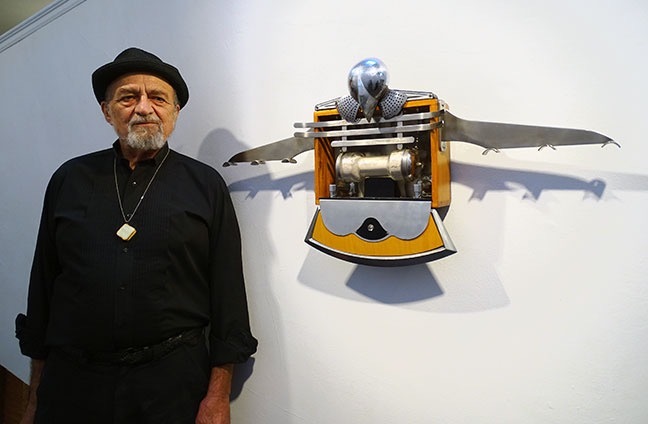 Join us for Al Honig’s opening reception, Sunday April 24th from 4:30pm until 6:30 pm. You can also shop from the many wares of Building REsources at that time as well. Hope to see you there !